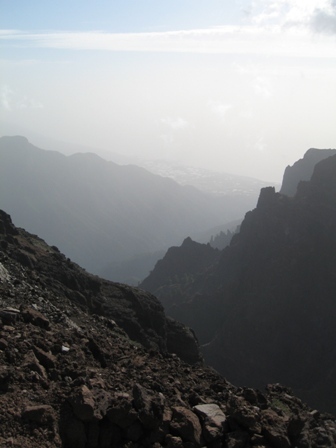 The Canaria archipelago is made up of seven major islands and many smaller ones and lie in the Atlantic Ocean to the west of Morocco in Saharan Africa and belong to Spain. 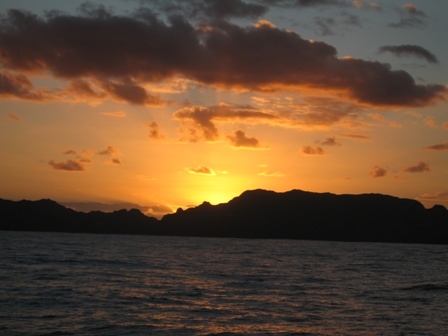 In fact, ancient sedimentary geological formations show that the islands were once part of the African continent. The islands were initially named 'Fortunate' by early visitors from Europe when Phoenician traders would collect the purple dye orchil from the islands. This painstakingly extracted purple dye was considered a luxury item of great prestige, so much so that the color purple became a way of showing wealth and power. In fact, Julius Ceasar enforced a law that only he and his household could wear purple rimmed togas. The high priests of Judaism, the Cohanim, would dye the fringes of their prayer shawls purple. Cleopatra also dyed the sails of her warship purple. Then in circa 60BC, King Juba II of Mauritania (Morocco) send an expedition to the Fortunate islands. The troops that came to the islands discovered large dogs roaming the islands and brought back two of them for King Juba on their return to Mauritania. 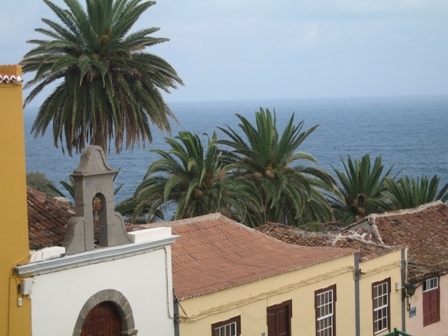 The typical Canary dog is much smaller now but the name Insulae Canium -The Islands of Dogs, continues today, Islas Canarias. I always thought that the Canary Islands got their names from the birds but the birds were actually named for the islands, not vice versa. The archipelago has a diverse range of landscapes. 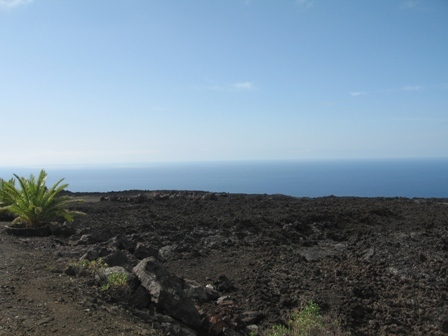 The most eastern islands, Lanzarote and Fuerteventura, are mostly barren, where Gran Canaria and Tenerife are semi-desert. 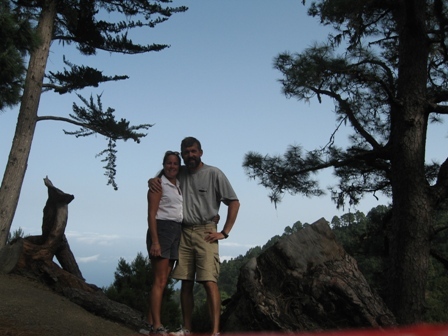 We chose to visit the island of La Palma, the most north-westerly island, because of its dramatic mountains and green woods, and that it has not been spoiled by tourists. 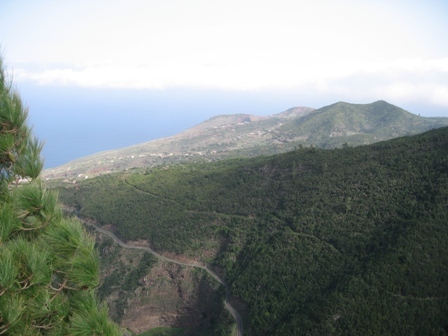 La Palma is also referred to as La Isla Bonita - "the Beautiful Island", or La Isla Verde - "the Green Island". 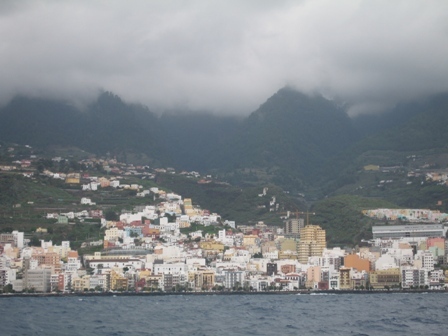 Marco and I left Porto Santo at around 11:00 am and headed for La Palma Island in the Canary Islands, located about 260M from Madeira. 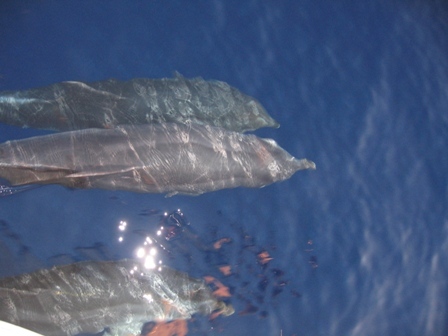 As we approached Illhas Desertas, 3 islands located 10 M south-southeast of Madeira, Marco spotted distant whale spouts and we also had many dolphin playing off our bow. This all occurred right around sunset and was really an amazing sight!!!! 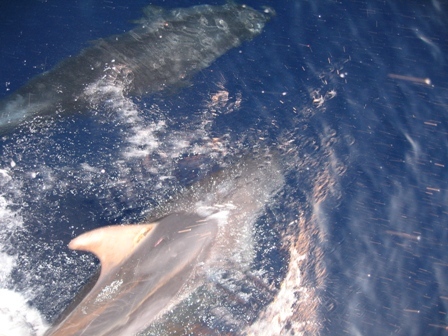 Marco filming dolphins and whales. Dolphin playing around the bow of Dalliance. It is an amazing sight, one we never get tired of. We could also hear their whistles and clicks as they played in the waves. 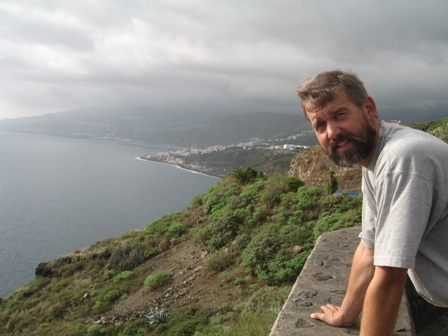 It took us about 3 days to reach the Canary Islands. During the second night shift, the moon was not out and it was one of the darkest nights Marco and I have ever sailed in. It was quite an odd feeling to be sitting in the cockpit and not being able to see anything off the edge of the boat except bioluminescence, and sailing along at about 6 knots. I think Marco described the sensation so well. He said it felt like being on an athletic field with your eyes closed and running, while occasionally getting pushed by someone. 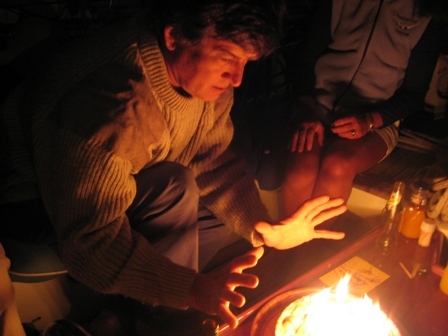 When sailing on such dark nights all you can do is trust your instruments that there is nothing out there and enjoy the sensation of sailing "with your eyes closed". 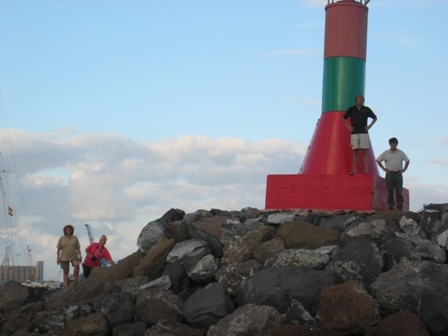 On November 20th we sailed into Santa Cruz de La Palma. 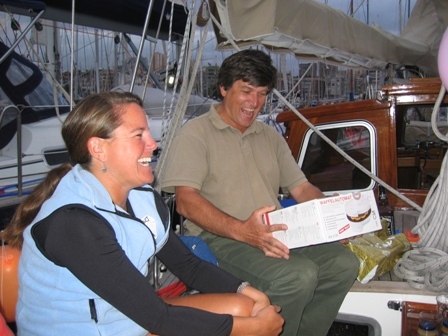 Throughout its history Santa Cruz has played a vital role in the economic and political life of Spain. 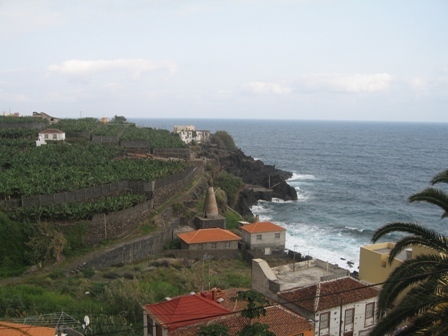 During the 16th century, Santa Cruz was the third most important port in the entire Spanish empire. 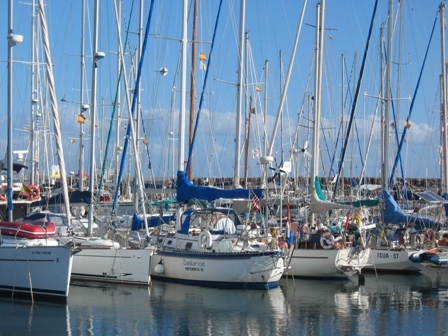 It was also considered to be the best shipbuilding center in the Canary Islands. Since Santa Cruz was so prosperous the towns wealth attracted many pirates, who would plunder the town on many occasions. A particularly brutal raid occurred in 1553 lead by Jean-Paul de Billancourt, otherwise known as "Pegleg". 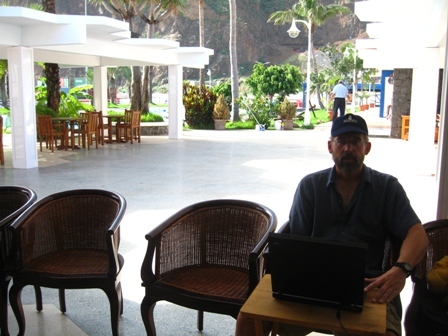 Marco checking email in the outdoor lobby of the marina. 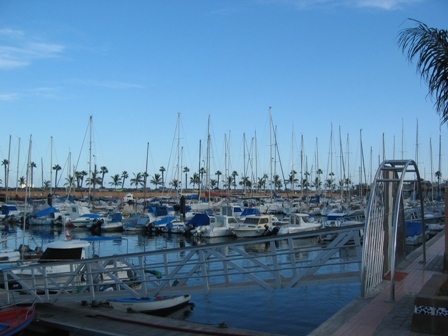 The salt water pool at the marina. 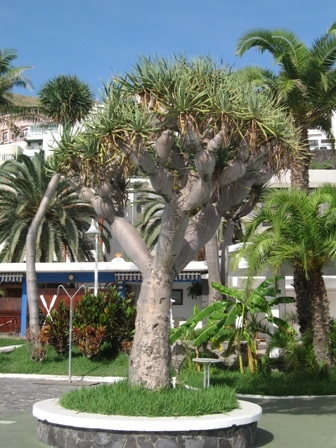 The Dragon tree is one of the most unusual plants in the Canary Islands. It's many thick round branches abruptly end with spiky leaves. The sap of the tree is red in color and is known as "Dragon's blood." The fruit that it produces has been used since the time of the Romans to make a medicinal powder and it was also used as a pigments for dyes and paints. Once we got settled in Marco and I decided to explore the beautiful town of Santa Cruz. View of the ocean from one of the many picturesque streets of Santa Cruz. 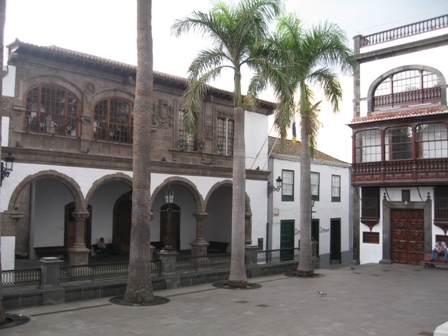 Casas Consistoriales on the left, used to be the Bishop's Palace but is now the town hall. It was built in 1559-63. 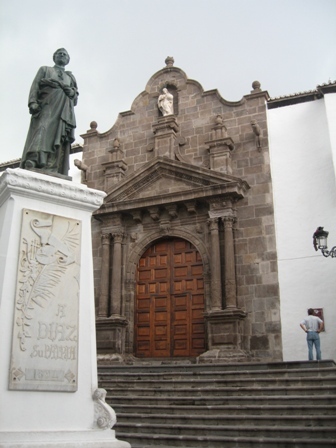 Iglesia de El Salvador was built at the end of the of the 15th century. 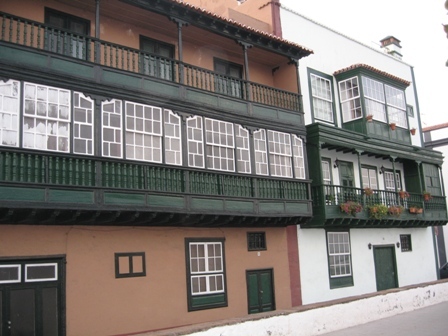 Examples of original Canarian houses with ornately carved wooden balconies. 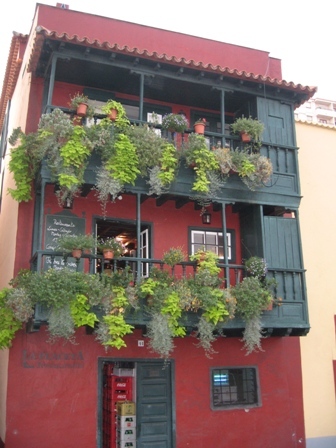 The first balconies appeared on the island during the early Spanish colonial days. 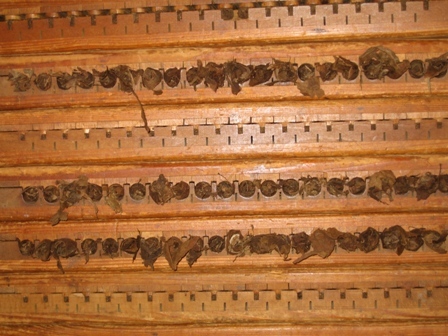 In time, balcony styles changed as the influence of Portuguese settlers began to spread. The balconies are really placed on the rear of the houses, and at one time used to contain the head or toilet. We were excited to also check out the night life of Santa Cruz. 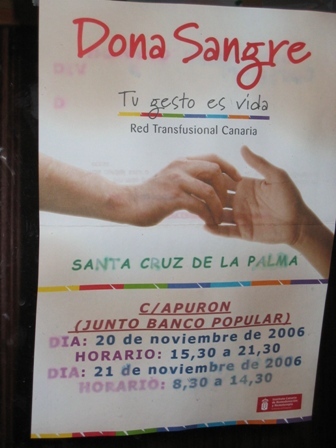 In one of the local bars we saw this advertisement for Dona Sangre. Despite the fact that neither of us really spoke any Spanish, clearly this must be an ad for a local female vocalist playing that evening. Imagine our surprise when it turned out to be a blood drive for the local blood bank. Learning the language is an interesting process. 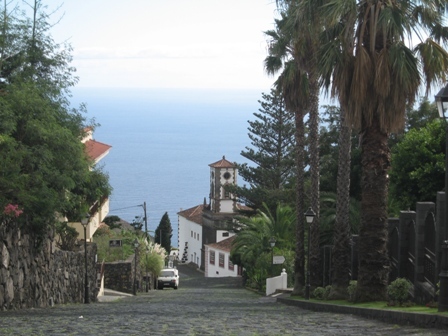 After getting a taste of the town we decided to rent a car and explore the island. 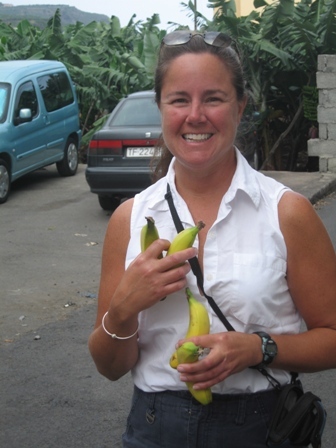 It took us 2 days, on the first day we explored the northern part of the island and the second day the southern. Santa Cruz is in the background to the left. 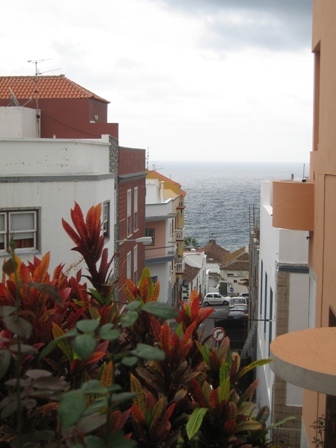 View from the pretty seaside village San Andrés. 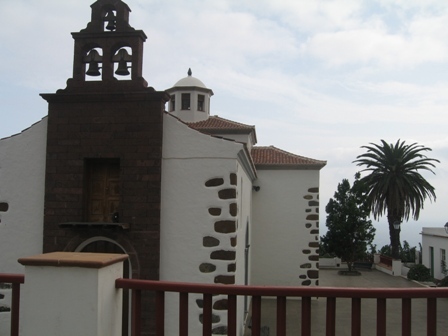 Inglesia de San Andrés Apostól was built as a fortified church in the 16th century and is one of the oldest churches in the Canary Islands. 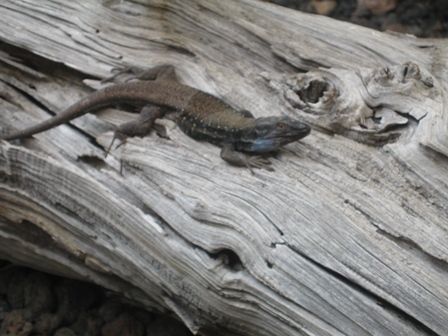 One of the many lizards you see all over La Palma. 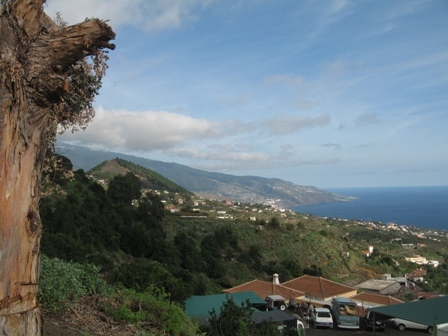 La Palma's island population engages mainly in agriculture. 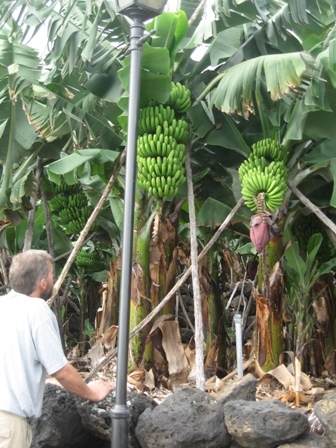 With an abundance of water, crops of grapes, avocados, tobacco and bananas are grown. 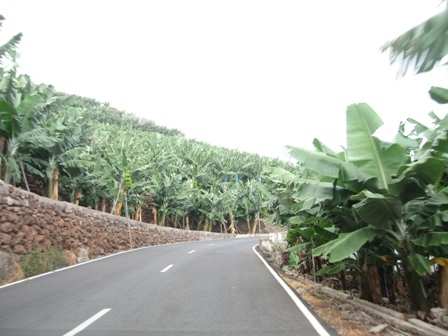 Every where we drove we saw banana plantations, they were even located in the center of some of the towns we drove through. 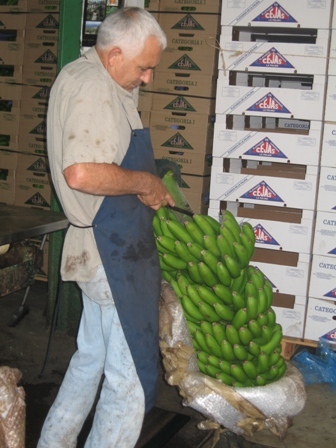 We stumbled on this little banana packing plant in the tiny village of Charco Azul. 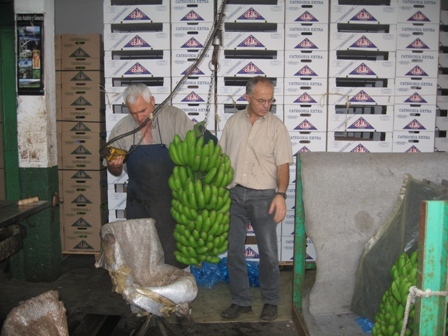 The gentlemen were very nice and demonstrated the technique of processing the banana for us. They even gave us a sample of the product!! YUM YUM. Marco and I decided to not take the main road but a secondary road on our tour. 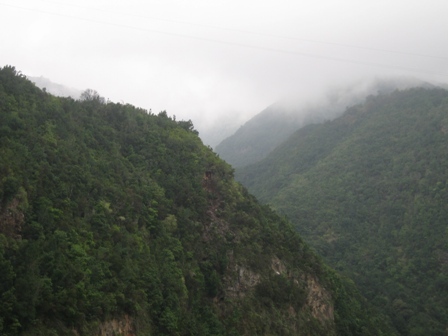 The road it self was quite narrow and criss-crossed its way up to the peaks of the tall mountains. This is an example of one of the tunnels that we were able to drive through, most of them one lane only. 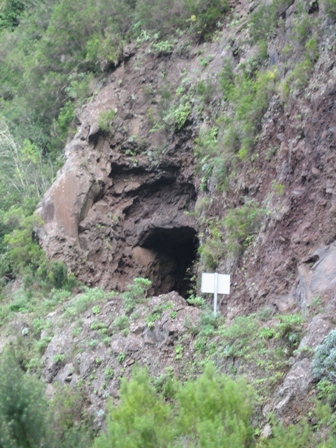 This is the archaeological site of La Zarza where visible evidence of the Benahores, former inhabitants of La Palma, have been left behind. 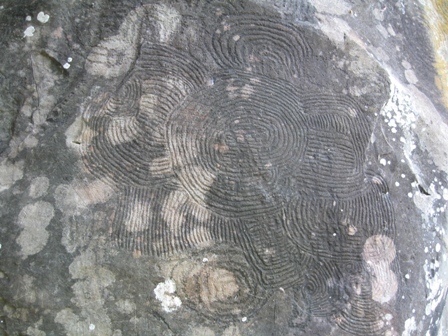 These strange carvings in that rock consist of spirals, circles, linear figures and two Aztec-style carved images: one a man and the other an abstract figure of a woman that has a head of an insect. What they mean is still unknown. They are still in their natural environment so you hike through laurel forests to get to them. We saw a few wild canaries on the walk. 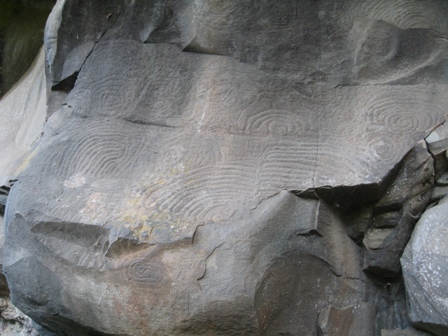 The carvings were discovered here in 1941. 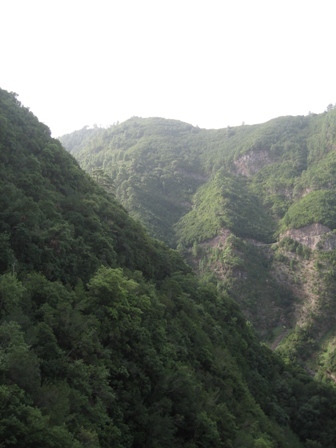 The forests consist of rich vegetation of ferns and laurel. 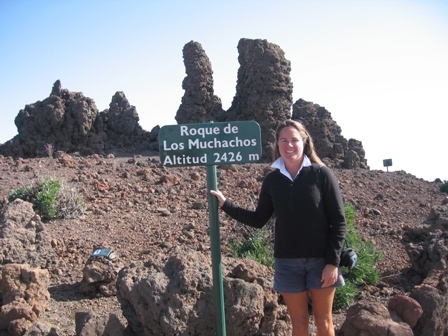 Thanks to the clear skies, the Canary Islands are regarded as one of the best places in the world for conducting observations of the cosmos. 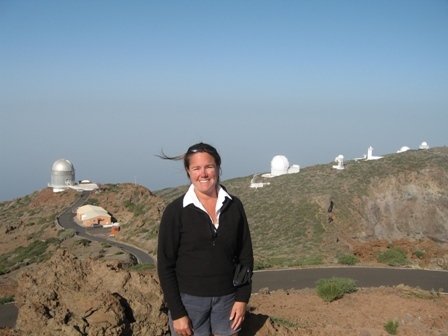 This is the International Astrophysical Observatory near Roque de los Muchachos, the highest peak on La Palma. The observatory was opened in 1985. 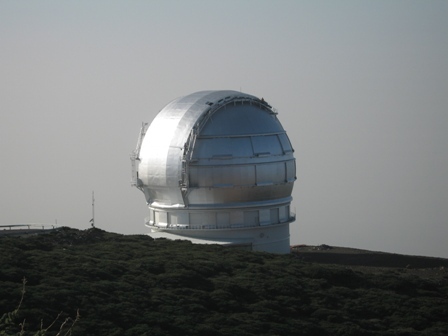 There are 6 telescopes, including the largest Anglo-Dutch one, named after William Herschel which measures 420cm (165 inches) in diameter. Observations are made at night, therefore there is a ban between 8pm and 9am on the use of your headlights. Marco and I made it a point to be off mountain way before dusk, the roads were scary enough to drive in the day light. 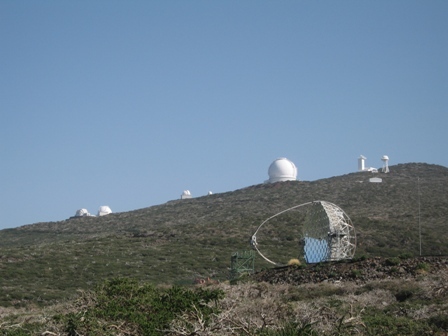 Once a year the entire island switches off its lights so that the observatory can make certain experiments possible. 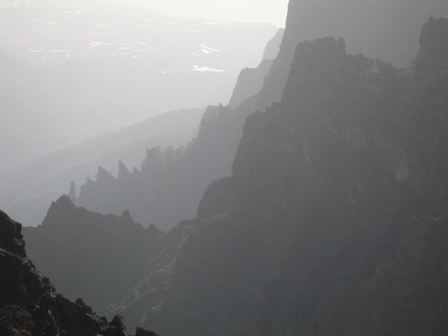 La Palma is claimed to be among the world's most mountainous islands, in terms of its height to area ratio. 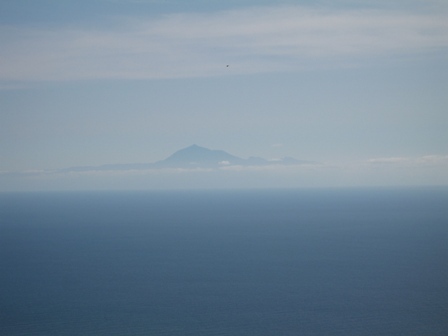 The island area is 706 sq km (273 sq miles) and the highest peak measures 2426 m ( 7,957 ft). 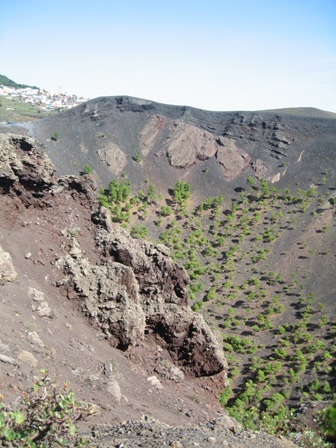 La Caldera de Taburiente is a massive crater that formed over the course of several violent volcanic eruptions and is considered the worlds largest volcanic crater. 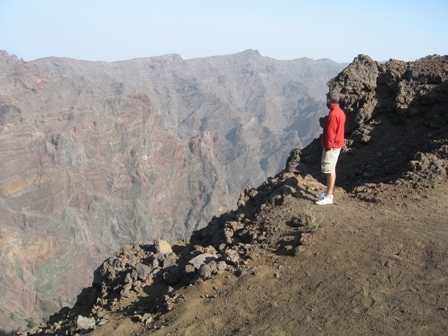 This erosion crater is 8km (4.97miles) wide and 1,500 m (4,921 ft) deep and the steep walls of the "crater-caldron" rise to over 2,000 m (6,565 ft.). 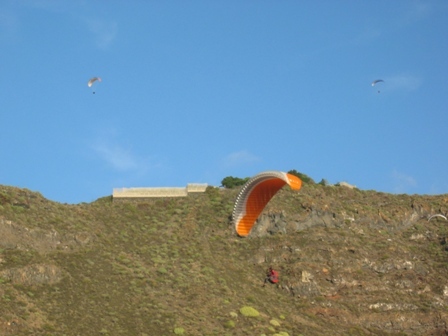 It is a natural fortress and was used as a place of refuge for the last Benahoares when the Spanish invaded in the 15th century. 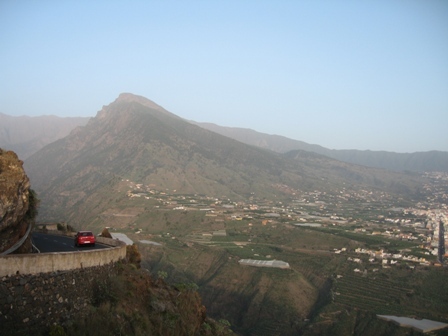 The viewpoint of Mirador del Time. 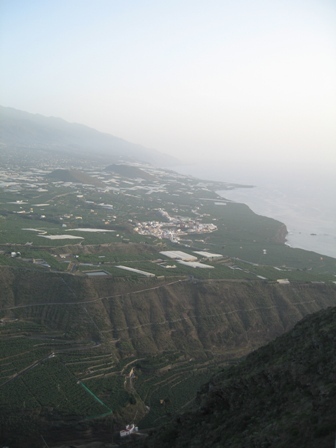 Here we could see over Los Llanos, Tazacorte and the surrounding mountains and ocean. 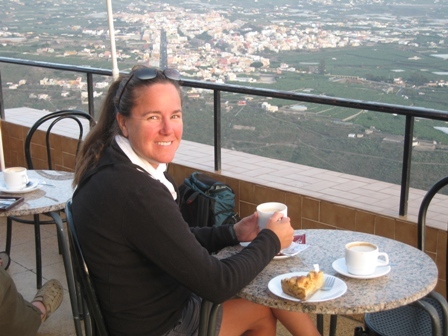 A cup of coffee and apple tart with a view, not a bad way to end a great day!! 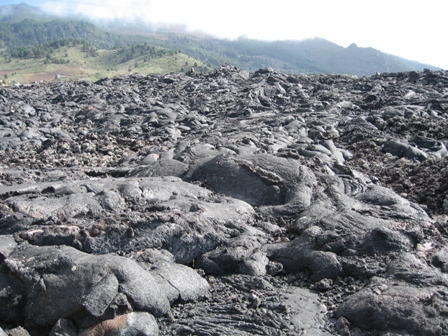 Day 2 of our tour took us to the southern part of the island where we explored the beaches and volcanoes. 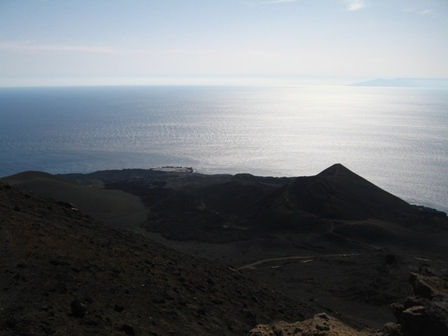 This is the island Tenerife off in the distance. 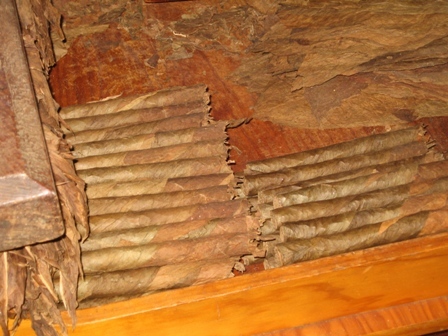 This is the town of Mazo which is famous for its homemade cigars (puros) The tobacco that is grown on the island is used to make cigars that are considered by the experts to be as good, if not better, than the ones produced in Cuba. 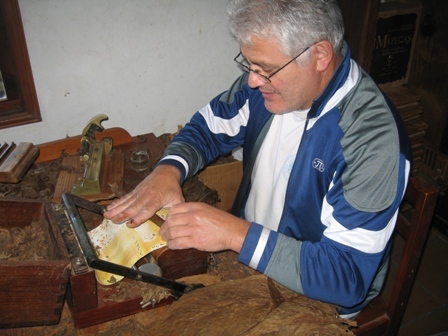 Here we got to watch this gentlemen make cigars in his home, these are truly homemade!!! 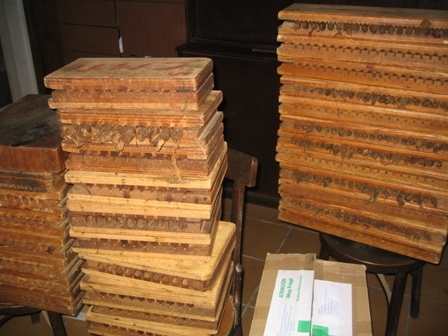 Rolled cigars waiting to dry in presses. 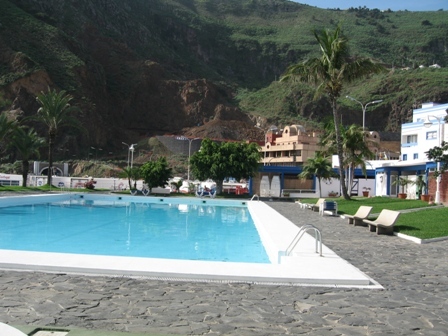 The name Fuencaliente de La Palma is derived from the words fuente caliente, meaning "hot spring". 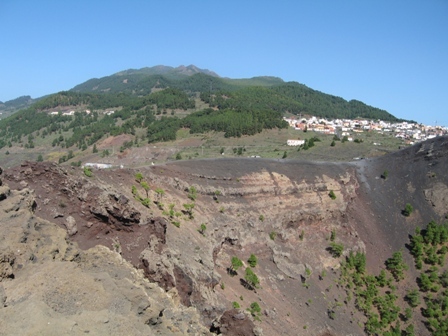 The eruption of Volcán Martin in 1646 however destroyed the hot springs that at one time were believed to be a cure for leprosy. View from the crater looking north on the western side of the island, the side that is supposed to slide into the Atlantic Ocean. 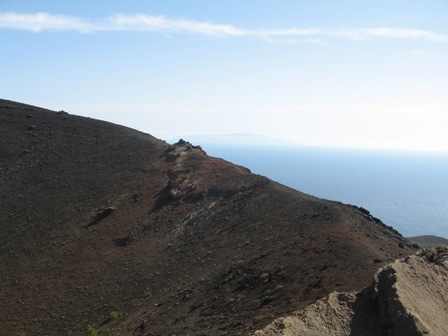 Along the roadside heading to the many beaches that line the western side of La Palma we found this lava flow from the last eruption in 1971. 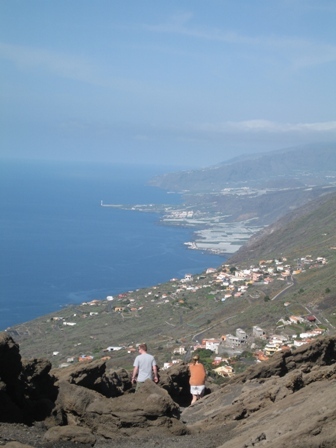 Next, Marco and I decided to take advantage of some of the great beaches and snorkeling that La Palma offers. So we headed up along the western side of the island and found a number of beautiful beaches. We already gave you an example of how poorly we understand the Spanish language. But we were sure we were alright with this one. 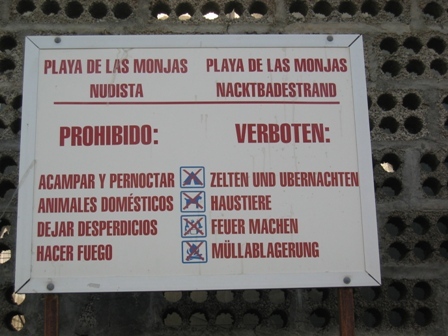 According to our dictionary, Playa de las Monjas means beach of the Nuns, sounds great, lets go!! Who would of ever thought it was actually a nudist beach!! 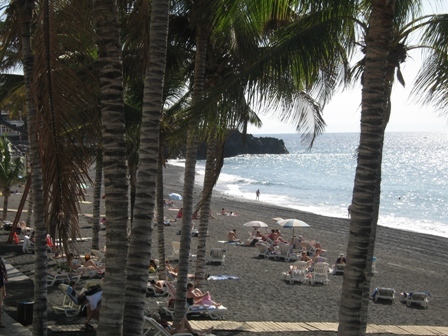 Puerto Naos, a small quiet resort town and has the longest beach on La Palma. The sand was black and the beach was lined with palm trees, a little slice of heaven. 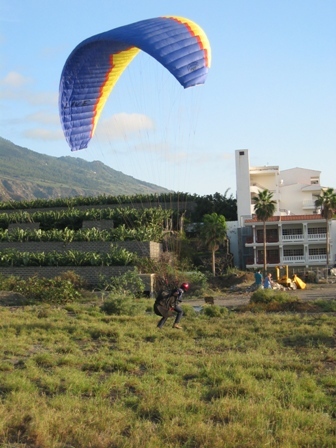 From the beach we got to watch the Paragliders land. This is the sunset that we watched on the beach on Thanksgiving Day. Marco and I missed being with our family and friends on this day but we both knew we had a lot to be thankful for this year!!! 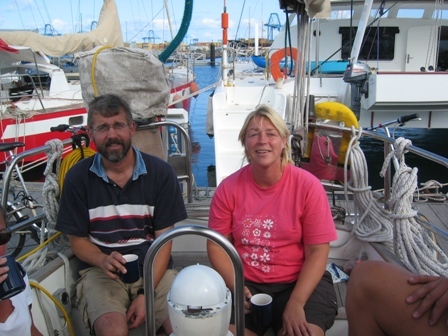 We left La Palma island on November 27th and would sail through the night to reach Gran Canaria the next day. 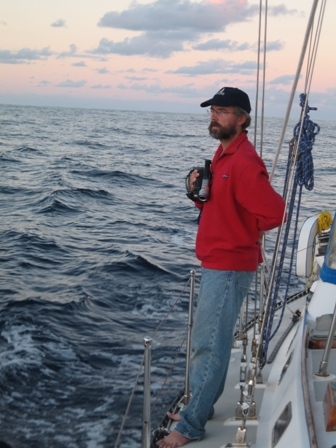 In the late afternoon Marco checked the Navtex and it reported that 3 - 40 foot empty shipping containers had fallen off a freighter, and were floating around N 28 - 45, W 016-00, exactly where we would be sailing in the middle of the night. 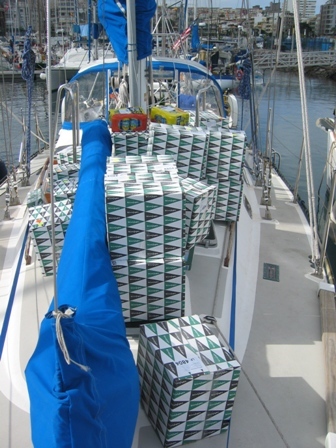 We altered our course after we calculated the set and drift, E wind and SW current, so that we would stay north west upstream and upwind of the containers. It was ironic because just the day before Marco and I were having one of our deep discussions about sailing and I told him that hitting a container was one of my fears when sailing, especially at night. 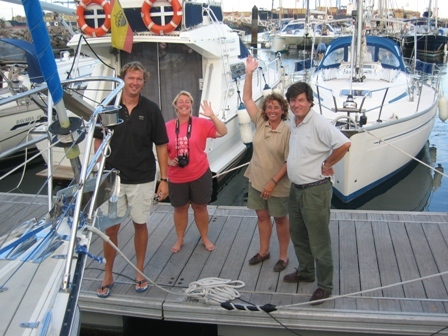 We arrived safely thank goodness in Las Palmas, Gran Canaria at 1800 the next day where Klef and Lena caught our lines!!! 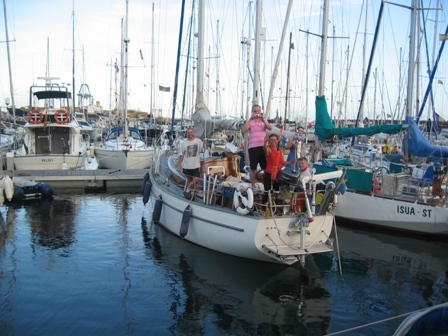 Here we would prepare Dalliance for yet another Atlantic crossing (2900 nm and 21 days). We wanted to leave for Barbados around December 5th so we would get there in time to celebrate New Years with Marco's brother David and his wife Katy!! We didn't have that much to do to get Dalliance ready but we had many friends to catch up with. 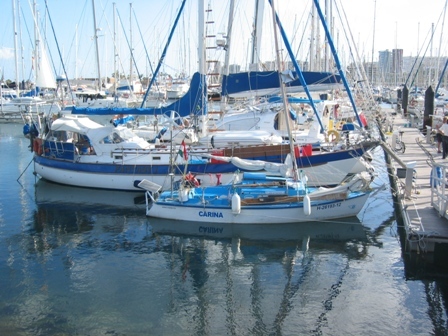 Las Palmas de Gran Canaria Marina is a large marina (1250 berths) and is the departure port for the Atlantic Rally for Cruisers (ARC) and also the port chosen for many sailors that are preparing to cross the Atlantic to the Carib. 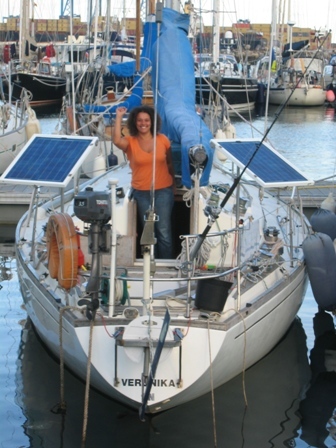 People are crossing the Atlantic Ocean in boats of all shapes and sizes. This particular one stood out, however, docked in front of a more traditional offshore boat, a Valiant 40. 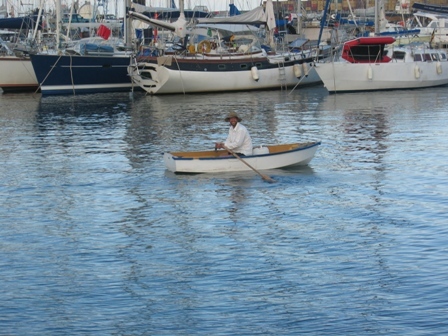 A guy from Hungary is sailing this boat single-handed. And you think our mothers were nervous! 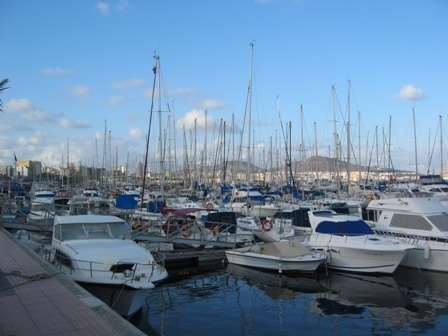 Our time spent in Las Palmas didn't include any sightseeing. 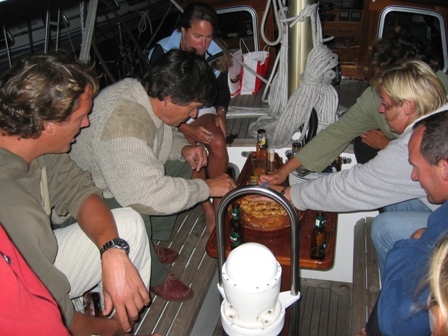 We concentrated on preparing Dalliance for her next crossing during the day and partied at night. 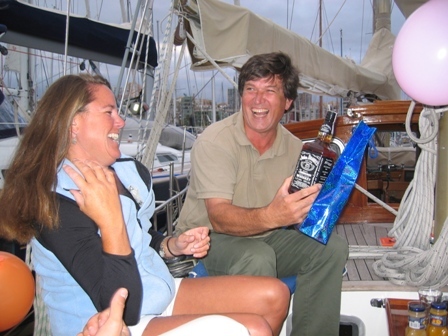 Jaap actually celebrated his 55th birthday while we were all together so Laura threw him a great party aboard Margalliti. Jaap's favorite drink is Jack Daniels, which he likes to order as John Daniels. When people invariably correct him he replies: "When you know Jack Daniels as well as I do you get to call him John". So Marco, Edo, Marieke and I took liberty and changed the label on a bottle of Jack Daniels to read "John Daniels". Marieke presenting Jaap with another present. She made a great speech!! Jaap with his new waffle iron. 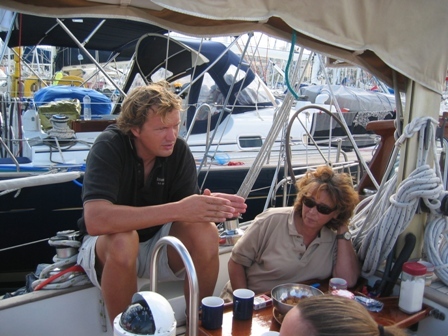 The four of us figured it would be a good way for Jaap to remember us by since having waffles aboard Dalliance in Porto Santo. Jaap cutting his Dutch Apple Tart that I made for his birthday!! No that is not a bonfire, just Jaaps birthday tart!!! We didn't have to do much to prepare Dalliance for her second crossing, but some things did need to be done. 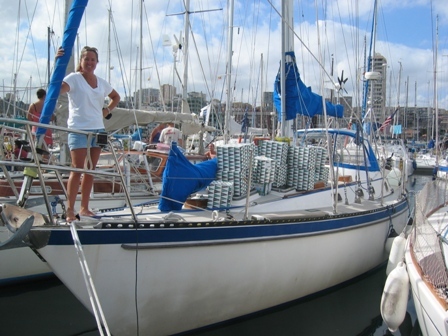 We hired a rigger to inspect and tune the rigging, filled the water and fuel tanks, changed oil and fuel filters and of course had to provision her for the crossing. Here are the boxes of groceries that were delivered from the grocery store. We expect to take about 3 weeks to cross but you always want to give yourself an additional week or so. Here is a months worth of food and supplies. It should last!!! 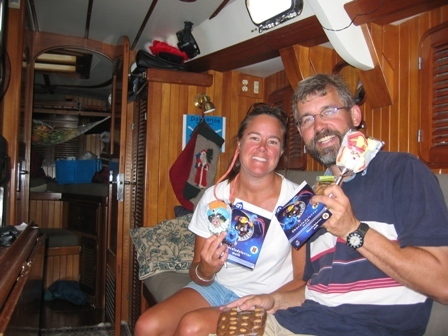 The day that we left to start our crossing was December 5th, Sinterklaas. We figured what better day to leave than this day. This way we would have the Patron Saint of Sailors looking after us!! 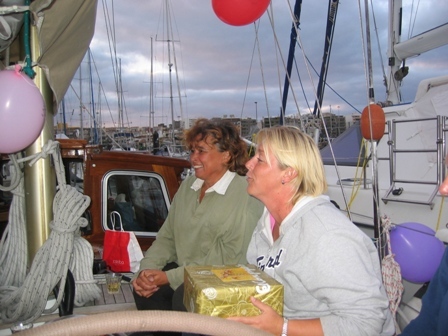 Before leaving, Marco and I went over to Jaap and Laura's boat to celebrate Sinterklaas. We had coffee, speculaas, pepernoten, the works. Jaap sharing his "pepernoten" with me!!! Marco's parents gave us a box to open on Sinterklaas when we saw them in Madeira. Inside was a fantastic poem and a bunch of great treats (chocolate letters, speculaas, pepernoten and a beautiful crystal candle holder). Dank U Sint en Piet!!! 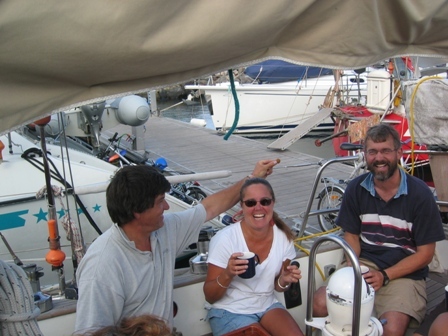 After calling our parents it was time to leave and begin our second crossing of the Atlantic Ocean. 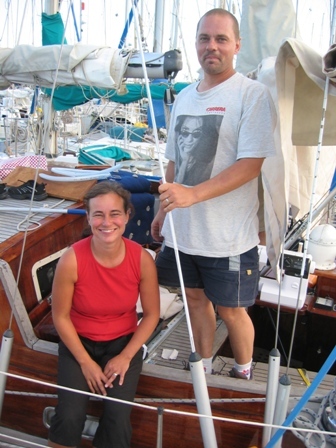 We were both very excited to get underway and experience trade wind sailing. Once again it was very difficult to say goodbye. 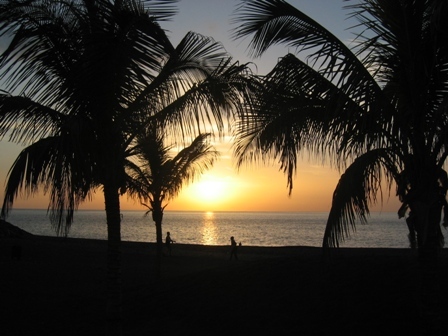 Edo and Marieke will be heading for Suraname soon and Jaap and Laura will spend Christmas in the Canaries, then hopefully they will head for the Carib!!! We plan to hook up with Klef somewhere in the Carib also. Edo, Marieke, Laura and Jaap sending us off!! The gang aboard Lena waving us off. We should be meeting them in Barbados soon.!!!! 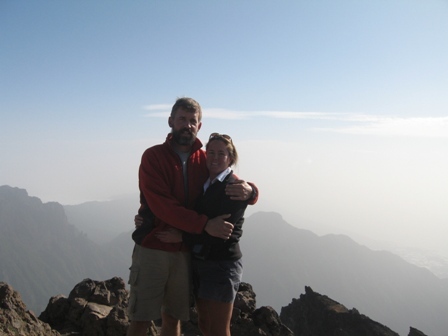 (Picture on the Left) We met Chris from New Hampshire in Porto Santo. He has been cruising for over 2 years and he taught us a lot in a very short time. Thanks Chris for everything and have a safe sail to Brazil!!! (Picture on the right) We met Bennedict and her family in Bayona, Spain and it was very fun to hook back up with them in Gran Canaria. With a send off like this how could anything go wrong?